Many conditions can cause a brain injury in a baby, some of which include birth asphyxia, hypoxic ischemic encephalopathy (HIE), intracranial hemorrhages (brain bleeds), infant infection, sepsis, meningitis, elevated bilirubin (jaundice) and kernicterus, untreated neonatal seizures and neonatal hypoglycemia. A lack of oxygen to the baby’s brain (birth asphyxia) is one of the most common causes of brain injury in a baby. Birth asphyxia can cause brain injuries known as hypoxic-ischemic encephalopathy (HIE) and periventricular leukomalacia (PVL), both of which can involve basal ganglia damage. HIE usually involves damage to the basal ganglia, cerebral cortex and watershed regions of the brain, but sometimes also includes PVL. PVL refers to an injury of the brain’s white matter near the lateral ventricles, which are located in the top section of the brain. Many babies with PVL develop fluid-filled cysts when white matter dies, which is known as cystic PVL. Babies born at term can develop periventricular leukomalacia from HIE, but PVL is more commonly seen in premature babies. What Are the Long-Term Effects of Basal Ganglia Brain Injury, Hypoxic Ischemic Encephalopathy (HIE) and Periventricular Leukomalacia (PVL)? If a child has hypoxic-ischemic encephalopathy (HIE) or periventricular leukomalacia (PVL), the medical team should perform regular brain scans (known as serial scans) to assess how the brain injury is evolving. Serial scans of the baby’ brain can give doctors important information about the nature of the child’s brain damage. Sometimes the medical team fails to recognize that a baby has a brain injury and brain scans are not performed. When this happens, parents may not notice problems until the child begins to miss important developmental milestones around the age of five or six. In some cases, brain injury—especially mild injury affecting the white matter—may not be evident on basic brain scans, such as an MRI. More sophisticated techniques may need to be used, such as a functional MRI (fMRI) or diffuse tensor imaging (DTI). These tend to be more costly and certain hospitals may not readily perform them. Neuropsychological assessments are often used to determine how a brain injury is impacting a child’s ability to function. These evaluations assess mood and personality as well as skills such as language and problem-solving. Images of a baby’s brain can help doctors determine the severity of the brain injury and what problems, if any, the child may face long-term. Of course, since brain injury is a progression, the full extent of damage may not be apparent for many weeks after the initial oxygen-depriving insult. It is critical for the medical team to closely monitor babies after birth for signs of infant brain injury, especially if the baby had a difficult delivery; birth asphyxia usually occurs during labor and delivery. Conditions such as the cord being wrapped around the baby’s neck (nuchal cord), umbilical cord prolapse and placental abruption can cause a lack of oxygen to the baby’s brain and birth asphyxia. When a baby is severely or totally cut off from the oxygen supply, it is called acute near total asphyxia or acute profound asphyxia. Conditions such as umbilical cord compression and placental abruption can cause near-total and total asphyxia, as well as acute profound asphyxia. Abrupt and severe oxygen deprivation causes near-total or total asphyxia. Acute profound asphyxia occurs when the baby experiences asphyxia that is moderate to severe and relatively prolonged. These types of birth asphyxia usually affect the deep gray matter or the deep structures of the brain, which include the basal ganglia, thalamus and brain stem. Research shows that injury in the deep gray matter (deep gray nuclei) is associated with severely impaired motor function and cognitive function. Motor function impairments typically lead to diagnoses of motor disorders such as cerebral palsy, which are disorders that cause a child to have problems with movement. Cognitive impairments often result in diagnoses of intellectual or developmental disabilities. Babies with a basal ganglia-thalamus pattern of injury have the most severe encephalopathy (brain injury). This pattern involves the deep gray nuclei and part of the cortex; the brain injury extends to the total cortex when severe. Partial prolonged asphyxia is a less dramatic interruption in blood flow. This type of oxygen deprivation usually lasts for more than 30 minutes. A partially compressed umbilical cord and use of Pitocin and Cytotec during labor can cause partial prolonged asphyxia. Due to the body’s compensatory mechanisms, when this type of oxygen deprivation occurs, blood in the brain is directed more towards the central, deep brain structures and away from the more superficial regions of the brain. Thus, outer areas, such as the cerebral cortex and white matter tend to become damaged during partial prolonged asphyxia. Indeed, the watershed and parasagittal regions of the brain are particularly vulnerable because they do not have a direct arterial blood supply. When the watershed pattern of injury is severe, it extends to the cortical gray matter. Injuries in the white matter portion of the brain typically result in cognitive impairments that often occur without functional motor deficits (movement problems). In fact, injuries to outer areas of gray matter, such as that in the cerebral cortex, also may leave the child without any motor impairment. Thus, a child may experience partial prolonged asphyxia and have no movement problems. Of course, movement disorders such as cerebral palsy can occur with partial prolonged asphyxia, acute near total asphyxia and acute profound asphyxia. As discussed, premature babies who experience birth asphyxia are susceptible to periventricular leukomalacia. 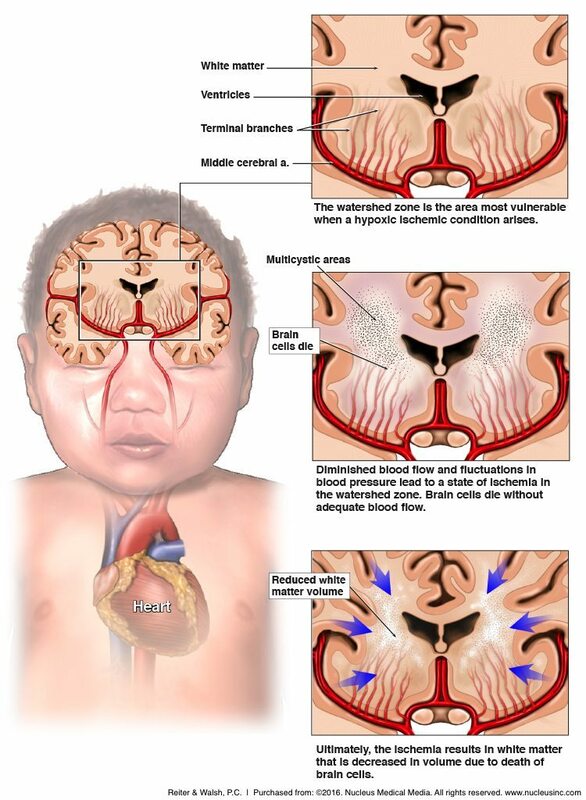 When a baby has PVL, the injury is often seen in the watershed zones in the periventricular region. When a baby has hypoxic-ischemic encephalopathy, hypoxic-ischemic lesions and other evidence of brain damage are seen on brain scans (although the full extent of injury may take weeks). Depending on the nature of the birth asphyxia and the condition of the baby, lesions can be in many different parts of the brain, such as the basal ganglia and periventricular white matter. Babies can experience partial prolonged asphyxia in addition to acute types of asphyxia, resulting in a mixed brain injury pattern. What Causes Birth Asphyxia, Basal Ganglia Brain Injury, Hypoxic Ischemic Encephalopathy (HIE) & Periventricular Leukomalacia (PVL)? In the womb, a fetus receives oxygen through the umbilical cord. Oxygen-rich blood travels from the mother through the placenta and then to the baby through a vein in the umbilical cord. Anything that affects this flow of blood can decrease the baby’s oxygenation. Thus, if the mother’s blood pressure drops or there are problems with the uterus (womb), placenta, or umbilical cord, the baby may experience birth asphyxia. In certain cases, such as a complete placental abruption or umbilical cord compression, the baby can be completely deprived of oxygen-rich blood and will then have to rely on fetal reserves. These events are obstetrical emergencies and the baby must be delivered right away before the oxygen deprivation starts to cause brain injuries such as hypoxic-ischemic encephalopathy and periventricular leukomalacia. How Do Birth Asphyxia, Basal Ganglia Damage, HIE and PVL Cause Cerebral Palsy and Long-Term Problems? When babies to experience oxygen deprivation, hypoxia occurs. Hypoxia is a complication characterized by insufficient oxygen levels in the blood and tissues. In addition, carbon dioxide levels also increase, which is called hypercarbia. Hypoxia causes the baby to start to generate energy without oxygen, which a process called anaerobic metabolism. This and other processes that occur when the baby is oxygen-deprived cause lactic acid to build up in the blood. The high carbon dioxide level along with the lactic acid build-up cause acidosis, which is characterized by the acidity of the blood. Acidosis and hypoxia can cause decreased heart function, which can cause very low blood pressure (hypotension) and decreased blood flow to the brain (ischemia). The insufficient oxygen level caused by the birth asphyxia causes ischemia, and the ischemia causes further hypoxia. Hypoxia and ischemia cause a series of events that disrupt the energy pathways in the cells, which leads to even more brain cell injury. The degree of brain injury in the baby depends on the severity of the asphyxia, how long the asphyxia lasts and the condition of the baby. HIE and PVL usually start to occur during the birthing process, with problems such as seizures and poor feeding starting to occur shortly after delivery. There is a groundbreaking treatment for hypoxic-ischemic encephalopathy, but it must be given within 6 hours of the time the birth asphyxia occurred. This usually means it must be given within 6 hours of labor and delivery. The treatment is called hypothermia (brain cooling) treatment and research shows that it halts almost every injurious process that starts to occur when the brain experiences an oxygen-depriving insult. During the treatment, the baby’s brain is cooled to a few degrees below normal for 72 hours. Cooling the brain in this way has been shown to prevent cerebral palsy or reduce the severity of the condition. If you are seeking the help of a Michigan HIE lawyer, it is very important to choose a lawyer and firm that focus solely on birth injury cases. Reiter & Walsh ABC Law Centers is a national birth injury law firm that has been helping children with hypoxic-ischemic encephalopathy and other birth injuries exclusively since 1997. 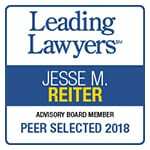 Birth injury and HIE lawyer Jesse Reiter, president of ABC Law Centers, has been focusing exclusively on birth injury cases for his entire career, and most of his cases involve hypoxic-ischemic encephalopathy (HIE) and cerebral palsy. 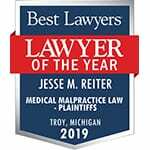 Partners Jesse Reiter and Rebecca Walsh are currently recognized as two of the best medical malpractice lawyers in America by U.S. News and World Report, a publication that also recognized Reiter & Walsh, P.C. 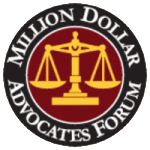 as one of the best medical malpractice law firms in the United States. The Michigan HIE lawyers at ABC Law Centers have won numerous awards for their advocacy of children and are members of the Birth Trauma Litigation Group (BTLG) and the Michigan Association for Justice (MAJ). If your child was diagnosed with a birth injury, such as cerebral palsy, hypoxic-ischemic encephalopathy (HIE), or a seizure disorder, the award-winning Michigan HIE lawyers at ABC Law Centers can help. We have helped children throughout the country obtain compensation for lifelong treatment, therapy, and a secure future, and we give personal attention to each child and family we represent. Watch a video of Michigan HIE lawyers Jesse Reiter and Rebecca Walsh discussing birth asphyxia and how it cause hypoxic-ischemic encephalopathy (HIE), basal ganglia brain injury and long-term conditions such as cerebral palsy, seizures and developmental delays.